We all remember the story of Chicken Little and her hysterical reports of a falling sky, but it will be fascinating to look back in a decade or so and see if the current incarnation of that bugaboo story is quickly forsaken by the political versions of the panicked poultry, or if it becomes the classic children's tale the earlier version became. The story may have been classic, but the lesson seems to have been forgotten by our contemporary Henny Pennys and Goosey Looseys. The current version has a few changes as you might image. In this telling, the Chicken Little and Foxy Loxy characters are melded together. If it was a movie that role would be played by that famous actor, none other than the inventor of the Internet, Al Gore. This time the character not only invents the problem, but offers the solution. One which benefits him of course, just like in the original story. And one which utilizes the historically popular "create a crisis out of thin air and then be the one who is conveniently nearby to save everyone" tactic. The fictional global warming crisis (now being called global climate change to reflect current cooling reality) is just such a rerun of that semi-successful past tactic. If it results in a "Cap-and-Trash the Economy" law as some statist dreamers hope, it will have been proved once again that you can scare people silly, if you have enough help. In this story, the mainstream press and TV "reporters" play Turkey Lurkeys, and so far, they have been sufficient help. Lots of people without the time or inclination to do their own research, have chosen to believe the helpful "Turkey Lurkey" press reports of the universal agreement of grave faced scientists that man made C02 emissions will soon cause irreversible damage to the world. As an aside, many of the true believers of this "conjecture as science" are primarily interested in saving the world itself, not the people who live upon it. So let's take a look at some actual science, instead of politics. Those who advance the theory that warming is caused by C02 levels, based on ice core samples, (the entire lever with which Al Gore lifts his case) have been oddly silent about that study ever since more recent (2003), more detailed data have shown that temperatures over the last half-a-million years have risen before carbon dioxide levels rose. On average, 800 years before. So perhaps the temperatures drove the C02 levels up (or not), but surely the reverse cause-and-effect Al was selling went up in smoke as fast as his college days doobies did. Above I have paraphrased the words of Joanne Nova from her website, where you can read more for yourself and decide if she is a serious student and commentator on the science of this issue. Below, her graph of the data is posted with her permission along with a quoted paragraph concerning it. You may download the entire Skeptics Handbook here. "In the 1990’s the classic Vostok ice core graph showed temperature and carbon in lock step moving at the same time. It made sense to worry that carbon dioxide did influence temperature. But by 2003 new data came in and it was clear that carbon lagged behind temperature. The link was back to front. Temperatures appear to control carbon, and while it’s possible that carbon also influences temperature these ice cores don’t show much evidence of that. After temperatures rise, on average it takes 800 years before carbon starts to move. The extraordinary thing is that the lag is well accepted by climatologists, yet virtually unknown outside these circles. The fact that temperature leads is not controversial. It’s relevance is debated." There are certainly other points to be made in the debate that hasn't really been held, but from my perspective, they are moot unless the above observations can be somehow be explained away. No C02 villain, no Captain-and-Trade hero. Last week, the new Energy Secretary, Henry Chu, described American citizens who refuse to play Henny Penny, as "teenage kids, who aren't acting the way we want them to act". He, like so many other government officials, think government is the family, they are the parents and we are the children. He may have forgotten the children's stories, but us rebellious kids haven't. In one version of the story, the wise King gives the previously terrified poult an umbrella in case any more acorns fall on her. It would be nice if the government in our version of the tale offered the same kind of protection her government gave her against fearing nonsense, but sadly, they propagate it. I don't write this piece merely as sport, but because the stakes are now so high in the poker game over American competitiveness in the global economy, an economy that is cooling instead of warming. And there are actual consequences for those of us who do not live with Chicken Little and friends in a children's fable. So my take is, let's use the debate as the umbrella solution the king offered. The sky isn't falling, but your standard of living will be if these inane ideas become insane laws. Once You Read This, Your Troubles Will be Over Forever. As a golfist, I read lots of golf magazines and books. And since my niece has suggested that I write an essay on pet peeves, I'm going to expound on one of my own pet peeves. Golf magazines always have a "hook" headline on the front cover. Not to be confused with the shape of the ball flight that has caused people to throw their $400 drivers into the trash, the "hook" I'm referring to is the preposterous headline on the cover that infuriates you so much that you feel compelled to read the article inside even when you know it's an outright lie. One of my favorites is; "Never Slice Again!" Seemingly, I have read every article written which promised that result, and I've tried everything that was instructed, but after almost a half a century of golf, at least fifty percent of my tee shots still slice. It's gotten to the point that I don't know if I want to be a good golfer or just an ex-slicer. By now you may have figured out that this piece isn't about golf or slicing. The above title is the same type of "hook" the golf magazines use to peeve me off. Once you read what I want you to read, your troubles will not be over. In fact, they might just be beginning, because it may change the way you think about problems and solutions, particularly the political ones we are currently facing. And almost everyone hates change even if they don't admit it. So this opinion piece is about economics. Huh? Indulge me once again if you can. I have never heard a trained economist describe it this way, but my definition of economics is; the study of human nature. One branch of it anyway. And as a way to distill it a bit more, it has been described by an actual economics professor as "a way to approach problems". A methodology for thinking things through, if you will. People make choices all the time even when they do not realize it, and since utopia is not an option, solving problems means making tradeoffs. Everywhere and always. An economist knows that and it shapes the way he views the world. The seminal event in my intellectual life occurred when, as a young man, I was given a well thumbed, used paperback book as a gift from a man named Walter Ramsey who was a broker on the trading floor where I worked. I don't know if I believe in fate, but I do believe in good fortune because my life has been one example of it right after another. For me, meeting Walter was fortunate for sure and perhaps even fateful. The book was Economics in One Lesson, written by Henry Hazlitt. Although I certainly recommend that you read it, I know that most of you won't for one valid reason or another so I will copy the essence of it, as he defines it in "The Lesson". "the whole of economics can be reduced to a single lesson, and that lesson can be reduced to a single sentence. The art of economics consists in looking not merely at the immediate but at the longer effects of any act or policy; it consists in tracing the consequences of that policy not merely for one group but for all groups." That simple sentence may not seem profound to you right now, but it is. And if you take it to heart, I'm guessing you will agree with that assessment after a time. I still care what other people think and I still seek their opinions, but my own opinions have been less shaped by what friends think, or what they will think of me if I come to a different conclusion than they do. And I think that although polls have their place, I ignore them even more than I did before I took the above lesson to heart. I replaced those things with my own analysis based on asking myself the question in the quoted sentence. Now, why do I write these things about my approach? It's because of the title of this blog. It's the WHY, in the "what we think and why". So, I "hooked" you in, and although your troubles are not over forever, I promise that if you take the lesson to heart and apply it to your thinking, you will hit fewer "slices" when you ponder most of the nonsense that the political busybodies foist upon us. 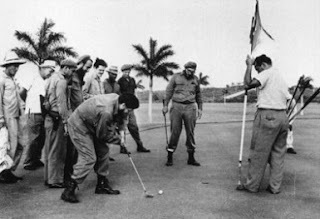 The birdies promised by the "I will mind your own business" crowd, almost always get carded as triple bogeys and the above picture of Fidel Castro and his golfing partner Che playing a match in the Caribbean workers paradise seem to be a good illustration of the consequences of not knowing the Lesson. Walter, if you are out there, I owe you more thanks than I can ever repay, even if it's likely that you have forgotten the gift, and perhaps even me, for that matter. But another lesson I learned from this event is that sometimes we have an impact on young people by what we say or do that outlives our memories. And that is a par worth making. After over four decades of experience in the financial markets, having a good understanding of profit motivation has made it fairly easy to ignore being called a racist by the usual race and poverty extortionists like Jesse Jackson and Al Sharpton. But now that the media and an ex-President have jumped into the dumpster with them and the third rate actress who was already in there for reasons of insanity, it may be time to close the lid and call Waste Management. The good thing about this situation is that it gathers the tactics, the practitioners and the ideas they champion all in one place for easier disposal. The bad thing is, we never seem to be able to pile enough clay on top of them to keep them from crawling out of the landfill every so often when people forget how bad the stench actually is. There is an old saying that “the first one to invoke Hitler’s name in any argument, automatically loses the debate”. I’ve never believed that to be true in all cases, but the idea that associating your opponent with a vile ideology can change the subject when losing an argument is certainly not new. Lawyers and spin meisters are well acquainted with the concept and employ it all the time. You’d think more people would catch on, but once you become addicted to hopiates, you can start hallucinating that people who disagree with your dreams aren’t merely stupid after all, they are actually evil racists as well. And since those who rode Obama’s “return to Camelot” train in the greatest number were the youngest passengers and didn’t understand it was a disastrous return trip to a dangerous illusion, they don’t have the advantage of hindsight. At least I’m in good company now that you can be put on the racist list without actually being white. As a kid, it was my understanding that only white people could be racists. Of course that wasn’t true, but the new racism definition includes anyone who disagrees with liberal dogma on “healthcare reform” and the “failure” of capitalism and freedom. Our recalcitrance stems from a racist hatred of President Obama according to Billy Carter’s slower brother. To stand as a fellow racist with the likes of Thomas Sowell, Walter Williams, Ward Connerly and Larry Elder is an honor. Anyone who is familiar with these luminary Americans and still utters racial epithets about others doesn’t have a problem with political correctness, they have a problem with rational thought. I’ve been fortunate enough to have been in the same room and actually spoken with three of them (I’m still waiting for the chance to shake hands with Dr. Sowell) but until this connection was established by our rabbit fearing ex-President, the personal association ended there. They have graced the page on this blog, not because they happen to be black, (and now are fellow racists) but because they share my love for freedom and happen to be smarter and better at communicating that virtue than I am. A few years ago I had the privilege of a short chat with Larry Elder after hearing him speak at a dinner gathering. I asked him a question which had puzzled me since I became a “born again” freedom advocate many years ago. It seemed to me, I told him, that the most natural constituency for the ideas of liberty in this country ought to have been the people to whom it had been systematically denied. That is to ask, why aren’t black people as a group the most vocal proponents of freedom in our society? After all, some of the best spokesmen for liberty today, are immigrants from Eastern European countries and various other kleptocracies around the globe. Those who have been abused the most, often defend it the best. Witness Svetlana Kunin, etal. Larry's answer then was as honest as he is, he didn’t know. And I still don’t know. So I guess it’s only logical that as individuals, the above named people are some of the best defenders we could hope for even if the group's political leanings still have me befuddled. Now that we have a President of color for the first time, it should have been a slam dunk for freedom based solutions to our various problems. Instead, we elected a man who dines at the statism table and seeks to re-enslave people, this time without regard to skin color. I guess the idea is that, you don’t solve servitude as if it were a problem, but instead ensure that all people are equally enslaved in the name of fairness. The slave masters this time around will be big government czars instead of whip wielding cotton farmers. It’s the same approach these folks have on poverty and the results will be the same. I’m afraid the people who will suffer most will be the people who support this replay of the horror story with the highest enthusiasm, that is to say, the younger people. That may seem like justice, but it’s like giving petty thieves life without parole. And in this case, the innocent will get the same sentence. 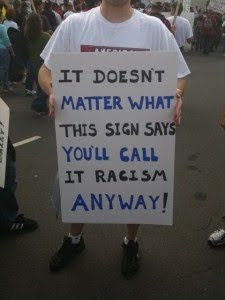 So, Jimmy Carter notwithstanding, the new “racists” mentioned above, the rude "shout out" specialists, and the sign carrying protestors at Washington marches of debatable size, are our best hope to avoid jumping into the historical dumpster with the USSR and all the other failed utopian nightmares that started out as the hopeful dreams of our fathers. A mini fire storm has erupted in the media in regards to the rudeness of a congressman who lost track of where he was when he audibly blurted out his opinion of a whopper the President of the United States had just uttered to a joint session of congress. As if it was a real news story, it is being covered by just about everyone with a keyboard or a TV camera pointed at them. But the truth is, the rudeness "story" is a purposeful distraction designed by clever spin meisters and then parroted by the dim bulb "reporters", in a media which seems enamored with changing the subject from the truth (or lack thereof) of what the president said, to how he was called on it. The story they want you to focus on is all about the loss of civility, in a society that has been anything but civil since the very beginning of our republic. A check of history yields so many rude attacks on the veracity of various presidents that they are too numerous to cite in this space. And even the arena of the insult isn't particularly rare. The former president, George Bush, was actually booed in that same venue by the very same folks who are righteously indignant this time around. The (hopefully) soon to be deposed, and ever so polite senate majority leader, Harry Reid, called George Bush "a liar" way back in 2002 in a dispute about moving nuclear waste to his state's Yucca Mountain. And according to a web search, former President Harry Truman, once described Richard Nixon as "a shifty-eyed goddamn liar . . . He's one of the few in the history of this country to run for high office talking out of both sides of his mouth at the same time and lying out of both sides." So much for civility in the past. Now, what about the current president? He has been calling so many people liars lately, (not to mention other names) that I doubt if it even fazed him when the tables were turned, although the congressional joint session "outing" probably caught him a tad off guard. He hadn't planned on it and it wasn't on the teleprompter. I guess he ignored it, but I admit I wasn't watching. Maybe his earlier call to have liberal operatives report the identity of any fellow citizens who say anything "fishy" about his government run health insurance scheme was merely a way to call them liars to their faces. If so, damn sporting of him I'd say! In lieu of that, he has settled for saying (ad-nausem) that unnamed people were "lying" about his plan. Which is particularly difficult to do since he says there is no specific plan yet. And that is darn convenient as well if you are trying to get people to agree with something (in a hurry, as usual) which no one can describe in detail. As we all know, Lucifer hides in the details of grandiose plans. Regular readers of my essays will remember that the Cato Institute ran some very respectful ads in many large newspapers across America which started with the line, "With all due respect Mr. President". Those ads were a paragon of civility as they called the President on his lies. With the exception of you folks and a few others, no one much noticed. Those challenges to his integrity surely weren't the "news" stories that the recent crude approach has become. The real story isn't news to anyone I know. Birds fly and Politicians lie. Republicans, Democrats and all the rest. They think, "you just can't handle the truth". So what is the President's record on telling the truth? I'm afraid it is abysmal. More importantly, does he lie on the so called "health-care" issue and did he lie about the issue in question regarding the inclusion of illegal aliens in accessing health-care insurance under a new law? The answers are, yes and yes. And THAT is the real issue, not the rudeness of the person who exposed it in an inappropriate manner. From my perspective, that is the truth about lying. So, three cheers for bad manners when it comes to focusing attention on matters of this importance. President Obama, some members of congress, and now that paragon of morality, Al Gore, have recently and very publicly said that government interference in health insurance is a moral imperative. I am quite certain that it has moral implications, however that is a tad different than being an imperative. I’m always more than a bit skeptical when a group of people like politicians (who have an abysmal track record on ethical matters) try to make the case for more government based on a moral argument. Living in Illinois can easily turn that skepticism into cynicism. But I digress. In my mind, Putting politicians in charge of morality is like putting pedophiles in charge of day camp. Even those who are agnostic towards organized religion generally seem to agree that, although not all of them concern our interactions with one another, most of the Ten Commandments are an excellent set of rules by which to live. You know ‘em so I won’t fuss over the obvious ones. Which brings us to the curious inclusion of the last one. P J O’Rourke did an essay concerning it some time back which was enlightening as well as hellarious. It is my belief (which may or may not be shared by real theologians) that there is a popular but mistaken emphasis on the greed aspect of "Thou Shalt not Covet." You know the kind of covetousness I'm talking about. The “Gee, I’d really like to have a car as nice as my neighbor and as much moola as him so I could drive his wife (whom I also long for in sin) to a really posh restaurant on the sly”. While all of the above are certainly a focus of the rule, it seems to me that there is a form of it that is even more destructive and distracting to us mere mortals. Or; “That guy isn’t worth that kind of money, he only works at a bank while I bust my hump everyday working at a job I hate for a boss I hate even more.” Bank executives, oil company executives, professional athletes and almost everyone at your company (who makes more than you do) fall into that category, they all make "too much" money. It is the reason people scrape a key along the side of a BMW. Or why indignant teenagers dig up the greens at the country clubs their parents cannot afford to belong to. It’s also the reason people would romanticize Bernie Madoff while detesting his victims if only he had lived in a $500 a month apartment and given the loot to “Save the Whales” or the "Make a Wish" foundations. After all, his victims deserved to lose their money, the arrogant rich bastards probably inherited it. In some circles, his only mistake was in living larger than his marks. The idea that nobody should have a lot more than anyone else is the basis for the most immoral ideology in all of history, communism. And its first cousin, socialism, is merely a rest stop on the road toward that destination. 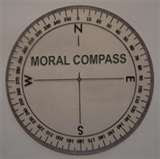 While it is always sold as the only truly moral philosophy, in reality, it is the runt of the philosophical litter. On Friday Aug. 21, 2009, a Russian immigrant, Svetlana Kunin, wrote the best “letter to the editor” of the Investors Business Daily that I have ever read. I recommend that you read it as well. In that letter she wrote, "Critics say that greed is the driving force of capitalism. My answer is that envy is the driving force of socialism." Equal misery may appeal to the intellectual runts, but the water level of humankind has never risen under such thinking. And even the Envy Pimps are starting to sink under the weight of their rhetoric now that the prospect of drowning in a government run sea of health care rationing has even the most distracted among us finally treading water. So, as long as the politicians brought up the usually taboo topic of morality first, I feel I can comment on it despite the lack of any above average moral bonifides. After all, even a run of the mill sinner knows at least as much about morality as Al Gore knows about global climate change. Poor Al, the public option fever is cooling even faster than the world is. And morally speaking, that is something I pine for, if not covet.